(ii) assess the implications of such processes and interactions with external actors and institutions for realizing the potential of SSE as a distinctive approach to development. To register for the conference, please use the online registration link provided on the top right of this page. 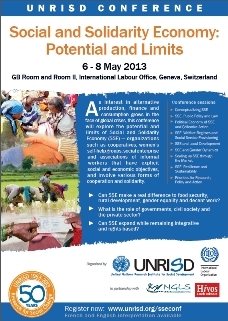 UN-NGLS (UN Non-Governmental Liaison Service) will be organizing a special session on alternative finance and complementary currencies during the afternoon of 8 May 2013 following the end of this conference. This conference is being co-organized with the ILO in collaboration withUN-NGLS.